A natural preparation with a high proportion of glucanes, enzymes, coenzymes, amino acids, trace elements and secondary plant substances. Contains a broad spectrum of natural nutrients which bring our immune system up to speed. Dr. Wolz Zell wins prestigious health food award for the second year in succession. Dr. Wolz Zell GmbH; and especially the preparation Zell Oxygen® Immunkomplex have been awarded the "Reformprodukt des Jahres 2014” by the German Reformhaus-federation. The Reformhaus-federation is the union of all German "Reformhauses" (Health Food Shops). This body has been in existence since 1887. The annual award is made in recognition of the work by Dr. Wolz for over 40 years in developing unique preparations. Zell Oxygen® Immunkomplex convinced the jury by its unique formulation of ingredients, its high ORAC of 5.500 per day and studies proving it's ability to destroy Free Radicals as well as to strengthen energy cell metabolism and performance. Free from lactose, glutin, pigments and preservatives; not heat-treated. No artificial additives, no preservatives, no colourings no excipients. Well tolerated by those who are normally intolerant to many foods and well tolerated by those who are intolerant to other yeast products. For people who are extremely sensitive, in particular ME sufferers – we recommend starting with Zell Oxygen, and once adapted, move onto Zell Immunocomplex. A living organism requires living nutrition, with versatile anti-oxidants. NADH is complimentary to Zell Immunocomplex, but can also be used in it's place if required; for less broad spectrum effect. More economical but still a very good cell energy provider. Selected concentrated fruit & vegetable complexes (only from organic cultivation); blossom honey, fruit & vegetable concentrates 22% (with apple, orange, grapefruit, lemon, Jerusalem artichoke, pear, sea buckthorn, aronia, cranberry, rose-hip, bilberry, elder, blackcurrant, carrot, beetroot, tomato extract with lycopene), all organically sourced. Vitamin yeast, alcohol (forms naturally during the fermentation process), wheat-germ oil, powdered acerola juice, vitamins, glucanes 1%, zinc yeast 0.7%, selenium yeast 0.3%, wheat-germ extract, chromium yeast 0.06%, natural pineapple flavouring. Store at temperatures below 16 C, if you do not intend to consume within one month. Do not freeze. Best kept refrigerated once opened. Zell Immunocomplex® is a concentrate, use diluted in a beverage of your choice during or after a meal in one time or divided during the day. We recommend the intake with apple or grape juice. A preparation which reflects the latest immune research from the Dr. Wolz enterprise. Active for the past 30 years in the field of health maintenance with special natural substances and assured effectiveness. Zell Immuncomplex is a natural preparation with a high proportion of glucanes, enzymes, coenzymes, amino acids, trace elements and secondary plant substances. This natural product contains a broad spectrum of natural nutrients which bring our immune system up to speed. A deficiency in vital substances can lead to diminished immune system performance. This is expressed, for example, in situations of increased susceptibility to infections or in states of exhaustion. Zell Immunocomplex is characterized by a high proportion of glucanes. Components of the walls of yeast cells are also designated as (1->3), (1->6)-?-D-glucane. These components stimulate our special defense cells and thereby activate the immune system. As natural components of yeast cells they do not generate epiphenomena. The ingredients of this high value immune active complex are not simply mixed together with the biologically cultured cellular components, extracted from Enzyme Yeast Cells, but rather, are incorporated into the special Dr.Wolz procedure. For this reason, this concentrate can also be designated as naturally grown. Likewise, and due to the fact that it is a liquid, the preparation is more rapidly and better absorbed. High bioavailability is particularly important, since what counts is what the body can absorb, and not what is provided to it. We are proud to present the Haug Report - a new report (Nov 2011) about enzyme yeast cells. This report is a compendium that sums up all of the relevant information about the development and effects of enzyme yeast cells and the respective scientific studies. Zell Immunocomplex can justly be described as an essential supplement. A more balanced and fundamental approach than oxygen therapy, and in almost all cases an key part of a regenerative programme. Zell Immunocomplex has all of the ingredients of Zell Oxygen with additional nutrients. This to be the superior product of the two; however for people who are extremely sensitive, in particular ME sufferers, we recommend starting with Zell Oxygen, and once adapted, move onto Zell Immunocomplex. Zell Immunocomplex (first released at the end of 2004) has been grown on a richer nutrient base than Zell Oxygen to provide more anti-oxidants, more trace minerals of chromium, selenium and zinc, and more Beta Glucans for the immune system. Recent research has demonstrated that Beta Glucans cause a significantly higher production of messenger chemicals used by the immune system cells to communicate with each other, in order to carry out the function of identifying and eliminating non-self entities in the body. The tremendous effectiveness of Zell Immunocomplex is partly due to the fact that all the nutrients are incorporated into the living yeast cell. During the fermentation process, a nutrient base is provided that is food for the developing and multiplying special yeast cells. The nutrients from the feed mixture are assimilated and converted into the living structure of the yeast cells; the nutrients are therefore pre-digested and contain many 'live' enzymes. Living cells have been shown to emit coherent light energy - this light has many benefits when consumed and is thought to aid cellular communication. When Zell Immunocomplex is consumed, the thin walled, baby yeast cells pass easily through the intestine and the components break open, to provide the ideal food for all our cells. Most of us are starved of oxygen, not because of low blood oxygen levels, but due to inadequacy of cell respiration; this in turn has been found to be due to poor mitochondrial structure and function. The mitochondria are rod like structures contained within every cell in the body. They have been aptly described as biological spark plugs. They act to trigger cellular activity, this includes respiration, and in turn, aiding cell nutrient uptake. When the mitochondria are functioning properly there will be activation of overall energy of the body, a strong active immune system and a good ability to heal/replace damaged cells and organs. This process is a corner stone of health. As we age the mitochondria get 'lazy'. They can also be damaged by chemicals, pesticides, vaccinations and genetic defects. Because of this damage all kinds of illnesses have become prevalent such as fatigue, M.E., Cancer, mature Diabetes, MS, Parkinson's, weakness of muscles, especially of the heart (including heart failure). Almost all of our bodily functions are hindered by damage and under-functioning to this vital part of our cells and rob our organs of energy, giving rise to an increasingly lowered immune system as well as increasing the chances of the development of all chronic disease. The daily consumption of Zell Immunocomplex is the best support for detoxification processes in the body with a minimum of unpleasant symptoms. In the short term this can be experienced with acute infection such as influenza. One can feel quite a lot better with the consumption of 'natural' anti-virals such as Colloidal Silver or Olive Leaf, eliminating the invading and multiplying micro-organism; however full vitality and feeling of well-being may not return straight away. By taking a high level of Zell Immunocomplex at this point such as 50ml 2 or 3 times a day for up to 3 days, one can often recover the feeling of well-being, often within hours. Detoxification, (without feeling worse as other methods of detoxification often leave us feeling for periods of time), is facilitated alongside general energy and well-being. So Zell Immunocomplex may be understood as a prime aid to get to the 'heart' of the detoxification process. However, if one wishes to take detoxification further, other remedies such as Barley Grass Juice Powder will work in other areas and provide deeper detoxification when you are ready. A well known Professor in Portugal - Serge Jurasunas, who has a successful natural health clinic, has used Zell Oxygen for over twenty years to treat chronically ill patients with much success; these include Cancer, CFS, Depression, Schizophrenia and other forms of psychosis. It is a tonic to the entire organism, a powerful antioxidant, increasing energy and accelerating hair-growth. Zell Immunocomplex is helpful in the reduction of Candida type symptoms, due to the action of the special live yeast cells. This may surprise some of you, as we tend to associate Candida with excess yeast. However, Zell Immunocomplex contains live saccharomyces cerevisaie yeast that is aerobic, as opposed to Candida that is oxygen 'hating'. The Zell yeast will take over the terrain where Candida is resident, forcing this more primitive life form out of existence, and at the same time the improved cellular respiration and immune system will complete the work in re-balancing the inner terrain. Zell Immunocomplex it is manufactured in a unique way, by Dr Wolz of Germany. He devised a special cold process, which enabled him to preserve the valuable enzymes inside the yeast cells. In each 30ml dose there are 150 billion bio-chemically active yeast cells. They are easily and quickly taken up by the small intestines, due to the thin walls of the yeast cells. Research undertaken in Utrecht, Holland, at The Institute of Molecular Cell Biology, proved that the thin walled yeast cells would have an immediate restorative effect on human cells. Rich in all B Vitamins as well as A, E, D, K, beta carotene, minerals, trace elements, and amino acids such as Methione, Gluthathione and Cysteine. Followed by Co-enzyme A and Co-enzyme Q 10 plus a number of other enzymes. Zell Immunocomplex has been used in competitive sports where sustenance was called for with much success. Zell Immunocomplex is able to absorb the free radicals produced by such efforts of extreme endurance. It is also given to horses to increase their chances of winning races. The action of Zell Immunocomplex, as stated, is to improve cell respiration - a superior method of 'oxygen' therapy, in the sense that taking oxygen supplements will drive the system in a positive voltage direction tending to create stress, and oxidative challenge (free-radical stress). Other oxygen supplements can lead to anxiety and insomnia for those with a weak nervous system. Zell Immunocomplex, on the contrary is healing for the nervous system; it is essential for treating chronic fatigue and nervous and mental disorders, as the cause of low oxygen is dealt with rather than loading the blood with un-natural amounts. Further information in the form of this complimentary book about Zell Oxygen & Zell Immunocomplex is available on request. In this short book, he discusses the studies clearly showing that the yeast saccharomyces cervisiae (as contained in Zell Immunocomplex), has a powerful inhibitory and elimination effect on Candida Albicans. It also discusses the reason why Zell Immunocomplex is such a beneficial remedy against chronic fatigue syndrome (M.E.) and how this relates to faulty cellular respiration and lactic acid production of the cells and it's correction by Zell Immunocomplex. Also discussed are misshaped red blood cells that cannot circulate properly into the smaller blood vessels can be corrected with Zell Immunocomplex. It should be noted that these factors occur in other auto-immune diseases. By improving cellular respiration Zell Immunocomplex aids the strength of the immune system to a significant extent, (See also section on Beta-Glucans). This in turn has a highly beneficial effect in a number of areas, including acute and chronic infections. Most chronic health disorders have an unbalanced immune system as a major underlying cause (See the article Factors Involved In Auto-Immune Disorders here). In the vast majority of cases, there is a chronic infection(s) such as Candida Albicans overgrowth, Mycoplasma, various virus and bacteria, parasitic infections that help to maintain the disease state. Zell / Live Cell Oxygen Immunocomplex helps the immune system to eliminate these chronic infections over a period of time, so indirectly bringing one into a better state of health. Other health problems specifically discussed in the book, and alleviated by Zell Immunocomplex are anxiety, neurosis, agoraphobia and cancer. Page 29 in the book describes how Dr Paul Segar, one of the world's most renowned cancer researchers, found that cellular respiration is damaged by toxins and this in turn leads to serious disease including cancer. Zell Immunocomplex contains all the antioxidant nutrients - Vitamins C, E, beta carotene, co-enzyme Q10, selenium and especially L-cysteine & gluthione. These help prevent mutational damage to DNA and are also anti-carcinogenic and free radical scavengers. Zell Immunocomplex also contains Krebs cycle subtracts and numerous redox substances such as gluthathione - a very important anti-oxidant. For many years, scientists have recognized the important of error accumulation in nuclear DNA, Mitochondrial DNA however has been virtually ignored despite the fact that each Mitochondria contains between two and 20 copies of the genome and there can be hundreds of Mitochondria in each cell. The spotlight is turning to the extreme susceptibility of Mitochondria DNA to undergo either spontaneous or free radical induced damage. The decline in the functional capacity of the cells with age, is now thought to be more due to the loss of Mitochondrial DNA. Zell Immunocomplex contain a synergistic blend of nutrients to help Mitochondrial DNA survival as well as DNA and RNA, to feed the Mitochondrial DNA. 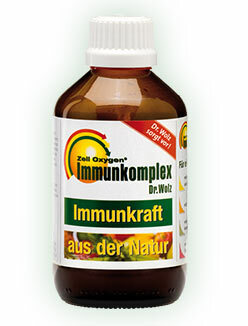 Are contained in Zell Immunocomplex at 900mg for each 30ml measure in addition to the wide range of other nutrients. Beta Glucans is a wonderful supplement; however the overall benefit to health restoration from Zell Immunocomplex is a result of the synergistic effect of all the 'food-state nutrients' it contains. The isolated yeast wall components designated as (1->3), (1->6)-?-D-glycans, recently demonstrated to be one of the most effective activators of the immune system, are worthy of special emphasis. Oriental herbalists have known for centuries that something inside yeast and mushrooms has the ability to dramatically enhance your immune system. Scientists have discovered it is a long chain of polysaccharides called Beta Glucans. The real discovery came from the specific kind - Beta 1,3/1,6 Glucan, found in the cell wall of Yeast. Beta 1,3/1,6 Glucans is truly a miracle of nature. It rapidly activates the immune system safely and naturally. Activation begins with your macrophage cells, one of the most important parts of your immune system, and its first defense against viral, fungal, bacterial and parasitic infections. Besides most pathogens, macrophages can recognize most tumor cells. In fact any cancer is fair game for an activated macrophage!" Once the macrophages are activated the body calls up the rest of the immune system response as well. Activating your macrophage cells results in a total immune response, assaulting invaders in full force until they are defeated. Considerable attention has been given to Aloe Vera extract, which was found to carry one of the macrophage activating polysaccharides, mannan or polymannose. While mannan has some macrophage activating potential, it is very slight compared to that of glucan. There are several different glucans with different levels of activity, the most active of which is beta-1,3-6 glucan from the cell wall of yeast. One of the most remarkable oral studies with beta-1,3-glucan was done at the US Armed Forces Radiobiology Institute. In a well controlled study, 70% of rats given a lethal dose of radiation were completely protected from radiation effects when given a dose of yeast beta glucan by mouth after the radiation. Dr. Myra Patchen discovered that beta-glucan is also a free radical scavenger. It is able to protect blood macrophages from free radical attack during and after the radiation allowing these cells to continue to carry their important functions in the irradiated body and release factors important to the restoration of normal bone marrow production. In light of what we know about free radicals today and their potential to accelerate aging and cause cancer and other diseases, this particular effect of beta-1,3-glucan is especially important. Free-radical scavenging assays were repeated in different models and which confirmed the antioxidant effect. Activation of macrophages, expressing increased non-specific phagocytic ability allowing macrophages to destroy pathogens more efficiently, frequently preventing disease. Release of important cytokines, such as IL-1, IL-2 among others, initiating immune cascade and triggering other cell lines, such as T-cells. Release of colony-stimulating factors, boosting bone marrow production. Cholesterol-reduction through cell activation and anti-oxidant activity. People with impaired immunity from any cause. People with high occurrence of infectious diseases, tumours and undergoing chemotherapy and radiotherapy; Age 40+ when the natural aging process starts to slow down immune reactivity, geriatric patients, and others with a compromised immune response. People that can possibly be affected by extra free-radical production caused by external sources: ones frequently exposed to low-dose radiation, including sun light, other types of exposures such electromagnetic fields; lack of raw fruits and vegetables in diet and eating preserved food. Extra free-radicals can also be a result of any chronic disease or chronic inflammation. People who exercise excessively, professional and amateur athletes as well as people who workout intensively and also those under physical or emotional stress who have a temporary immune deficiency which can result in infection. Beta-1,3-glucan will provide them with non-specific immunostimulation that can increase their resistance to illness. People with high risk of atherosclerosis should definitely add beta-1,3-glucan to their diet whether they are taking cholesterol-reducing drugs or not. Macrophage activation will not only help to draw extra cholesterol from the blood but it also can prevent further plaque formation on the arterial walls and phagocytize existing plaque which is recognized as a foreign body. In order that the individual substances can fulfill their immune-stimulating and anti-oxidative synergistic properties in a proper manner at the cell level, the substances are present in synergistic form, i.e. their combined effect is greater than the sum of their individual effects. It is in this connection that the amplification of the anti-oxidative effect, by the addition of the bio-active vegetable components, is of great interest. Bio-vegetable components include lycopene from tomato extracts, anthocyaninins from blueberries and natural carotinoids from vegetables. Free from lactose, glutin, pigments and preservatives. Not heat-treated. Includes versatile anti-oxidants from selected concentrated fruit and vegetable complexes (only from organic cultivation). Blossom honey, fruit and vegetable concentrates 22% (with apple, orange, grapefruit, lemon, Jerusalem artichoke, pear, sea buckthorn, aronia, cranberry, rose-hip, bilberry, elder, blackcurrant, carrot, beetroot, tomato extract with lycopene, all organically sourced). Vitamin yeast, alcohol (forms naturally during the fermentation process), wheat-germ oil, powdered acerola juice, vitamins, glucanes 1%, zinc yeast 0.7%, selenium yeast 0.3%, wheat-germ extract, chromium yeast 0.06%, natural pineapple flavouring. No artificial additives, no preservatives, no colourings and no excipients. Well tolerated by those who are normally intolerant to many foods, and well tolerated by those who are intolerant to other yeast products. Recommended maintenance use: 20-30ml daily. Health Issues: Up to 60ml daily. May be taken indefinitely to ensure the health of your cells and to maintain your energy. Best taken on an empty stomach, or just before food. May be added to cold drinks or water. Other use: Specific conditions (such as chemotherapy support) require short term high level use, details can be found in specific health condition articles. Tom, aged 37, from USA suffers from "something similar to Addison's. I was never diagnosed officially but any intake of carbohydrates pushes me into a state of serious brain fog and dizziness -- almost a drunk feeling in severe cases. Taking the daily dose of Zell Immunocomplex has significantly changed my life. I call it my "magic juice!" While I still experience spells of brain fog and dizziness in reaction to certain (or too many) carbohydrates, my overall well-being has significantly improved ever since I began taking this supplement on a daily basis. My mind stay's clear throughout most, if not all, of the day and I am able to stay focused at work -- something with which I struggled prior to finding this juice online. In a panic, when I was running low on my "inventory" one time, I did try ordering a version sold in the US but did not react as favorably (I noticed the brand sold in the US had a different ordering of ingredients so perhaps the formula is slightly different). Bottom line is that Regenerative Nutrition delivers the real deal... and I now just know to order multiple bottles at once so as not to run out! I am a loyal customer for life and thank you for making this product available!!!!"